I am pleased to announce I will be playing a 2nd set at Wintersong Music Festival January 20th in downtown Stouffville, joined by Jeff Haynes on guitar and Peter Bradley on percussion & sweet harmonies. You can find us Saturday afternoon for a set at Redefined Finds at 3pm! Redefined Finds is one of the venues where you can enjoy FREE shows for all ages during the festival! Wintersong Wristbands will also be available as of 5pm Tuesday, January 16th at the Wintersong Hub, giving you access to 50+ bands across multiple venues January 19th & 20th. Pick yours up in advance at the Wintersong Hub (6280 Main Street) Tuesday, Wednesday and Thursday from 5pm-8pm. And throughout the entire weekend. 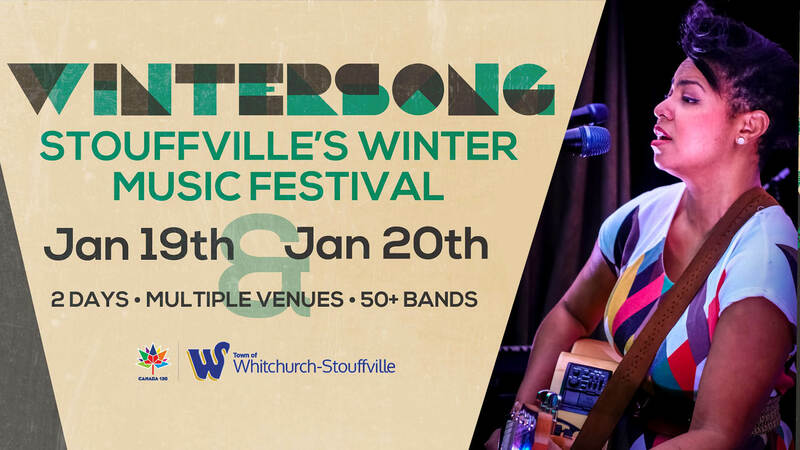 On the weekend of Jan. 19 & 20 Wintersong Music Festival will blanket the streets, pubs, restaurants and coffee shops of Stouffville Main Street with live music! Brought to you by the team that organized the 2017 Guinness Record Attempt By Epidemic Music Group for Longest Concert by Multiple Artists, Wintersong promises to warm your spirits and connect the community to the regions live music scene. Posted in Blog, Events, Shows and tagged as music, shows.